LOS ANGELES — Vasiliy Lomachenko is in no rush to move up to 140 pounds, but that doesn’t mean the unified lightweight champion won’t make a weight-class switch in the near future. Lomachenko revealed Tuesday that he’s considering a return to junior lightweight and has an opponent in mind. 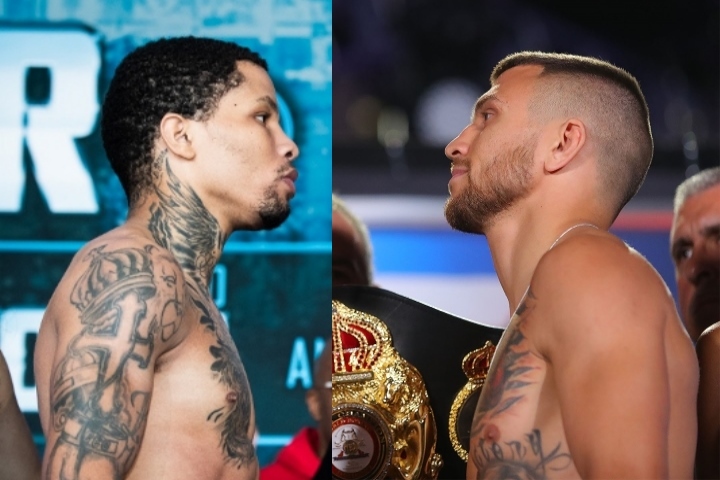 “Maybe after 135 I go down to 130 one more time and try to organize a fight with Gervonta Davis,” Lomachenko said after his media workout to promote Friday’s title defense against Anthony Crolla at Staples Center. It’s not the first time Lomachenko has pushed for a bout with Davis, the 130-pound WBA champion promoted by Floyd Mayweather. Lomachenko recently said Davis and Mayweather are more interested in money than making compelling bouts. The Ukrainian fighter doubled down on that statement. “It’s true,” Lomachenko said. “I can fight with him for free. I don’t need the money. I came for my goal … but (Davis) never stepped in the ring for free. Never. Bob Arum, like Mayweather, is also thinking about the money. Arum doesn’t view Lomachenko-Davis as a pay-per-view bout, and not because his fighter lacks star power. Arum said fights against Mikey Garcia and Teofimo Lopez, the rising prospect also promoted by Arum, would generate more money for Lomachenko than a bout with Davis. It says something when Arum views Garcia as a better option than Davis for his star boxer. Garcia and Arum had a messy promotional contract dispute that was settled in 2016. So Lomachenko shouldn’t hold his breath for a future matchup with Davis. But maybe there’s hope for a Lomachenko-Garcia unification battle if the WBC champion decides to return to 135 pounds. Garcia moved up to welterweight to challenge Errol Spence Jr. in a losing effort last month. Lomachenko is a heavy favorite against Crolla. The lightweight bout will be streamed on ESPN+ on Friday.